I reported some weeks ago that the Marsh Christian Trust, a charitable organisation that makes awards to good causes, had chosen Chris Leah of the Wooden Canal Boat Society for one of its awards for his sterling efforts, and that my photography was being used for the publicity. I have now received a copy of part of that publicity: the Marsh Trust’s handbook, detailing its bequests for the year; and there, alongside the write-up, is the shot they have chosen. I took this photograph of Chris Leah, aboard one of the boats in Portland Basin, Ashton-under-Lyne, back in 2013. 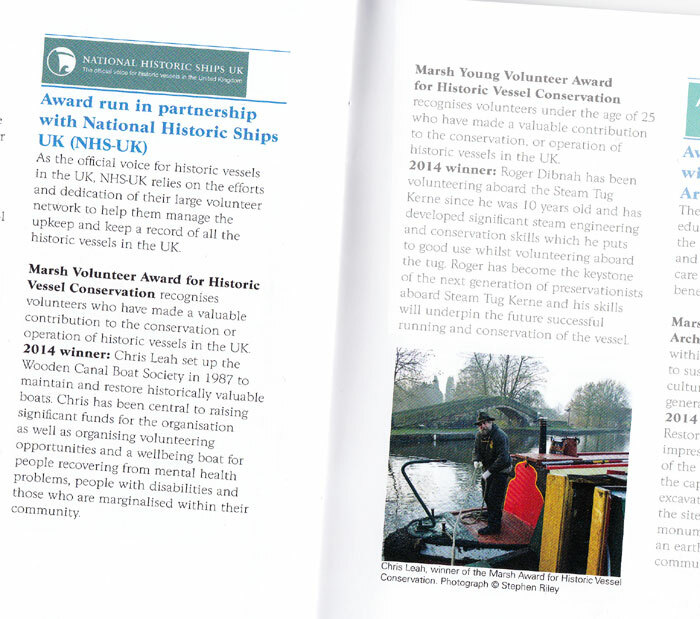 Chris's award was made under the heading 'Volunteer Award for Historic Vessel Conservation'. The Wooden Canal Boat Society, with Chris at the helm, rebuilds historic canal boats and puts them back into the water to provide therapeutic trips for people with and recovering from mental health problems. This is a very good cause and one gradually getting further attention in politics and the media, as mental health as an issue slowly emerges from its stigmatised, marginalised condition.